Nina Valley and Sylvia Tops. 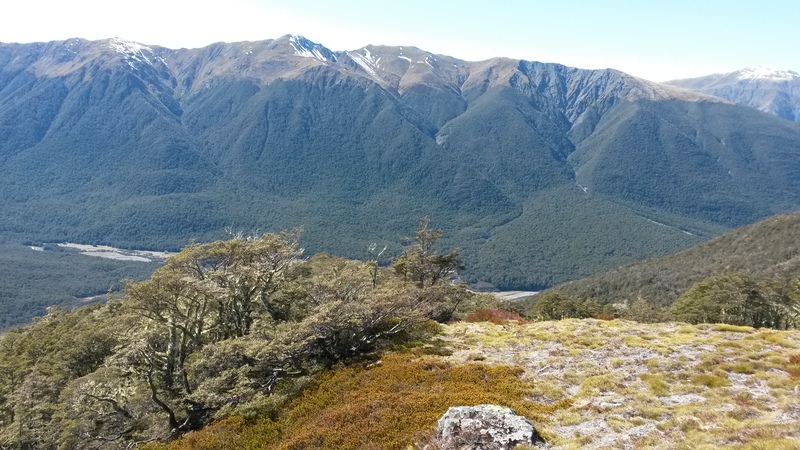 The hike looked pretty good as described in South Island Weekend Tramps. 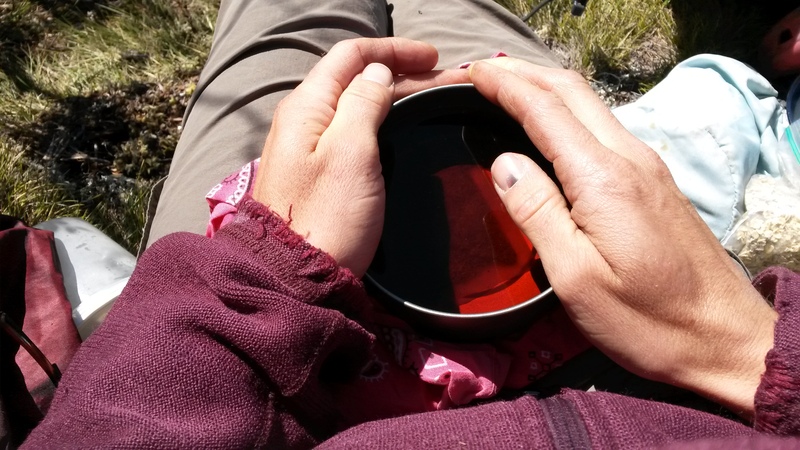 Most solo weekend tramps mean backtracking back to the car, but this one would be a loop. On the outward leg I’d following a “route” over the Sylvia tops, stay at a tiny hut on the saddle, and walk back out the Nina valley the next day. And I’d avoid the Doubtful valley. Not that I’ve been there or heard bad tales, but the name is a bit ominous. I looked carefully along the trail for any sign of a side path. It’s not a DOC track, so I doubted there would be a sign. 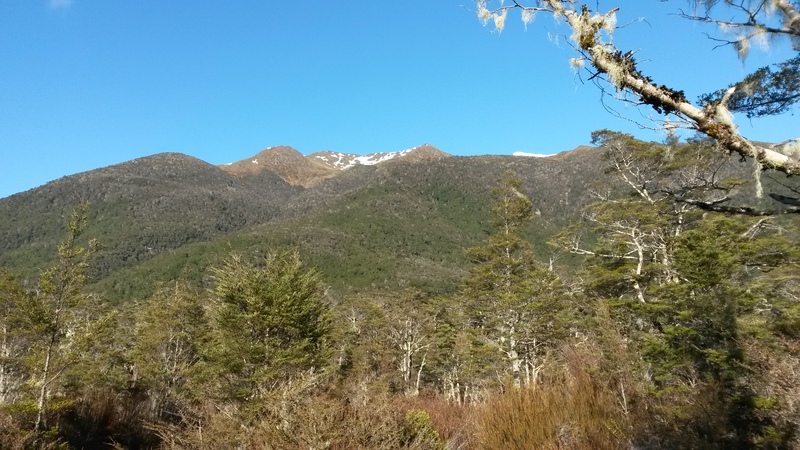 At a deer trail I cut over to the river flats and got a good look at the beech-cloaked ridge I had determined to climb. The river ford was tame (dry undies! ), but COLD. I wonder how many hours ago that water was snow. 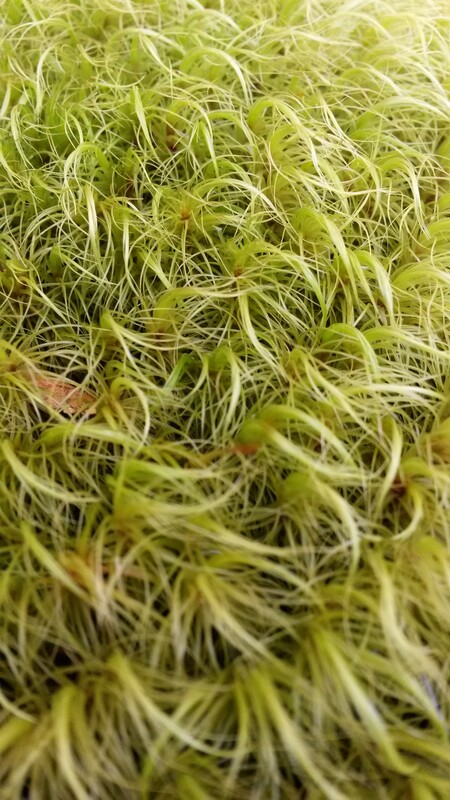 I spent the next two hours looking at moss and beech leaves and scratchy trunks up close. At first I appreciated the lush greenery. Then I remembered that I don’t like bush whacking (or “bush bashing” as they call it here). At certain moments the branches seem malevolent, snatching at my hair and snagging my ice axe. I would find a deer trail only to loose it again. I guess deer aren’t stupid enough to climb straight up hill, like humans. 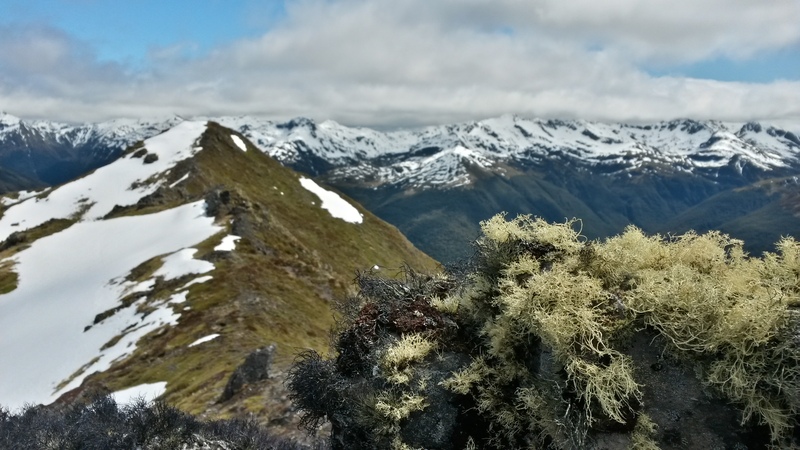 There are distinct advantages to hiking alone–when the going gets tough, there’s no one else to worry about, and I don’t have to apologize about the non-trail or wonder if I should have been on the next ridge over. Just keep going up. Bah, good riddance to that thick forest, I’m finally out in the thin lichen-clad alpine beeches. I chose my lunch spot carefully, rearranged my tattered hair, and settled down in the sun with a view. I don’t know why the beech forest ends so suddenly on the open tops, but I’m thankful. I enjoyed a restorative cup of tea! Here, now, is my terrain for the rest of the day. 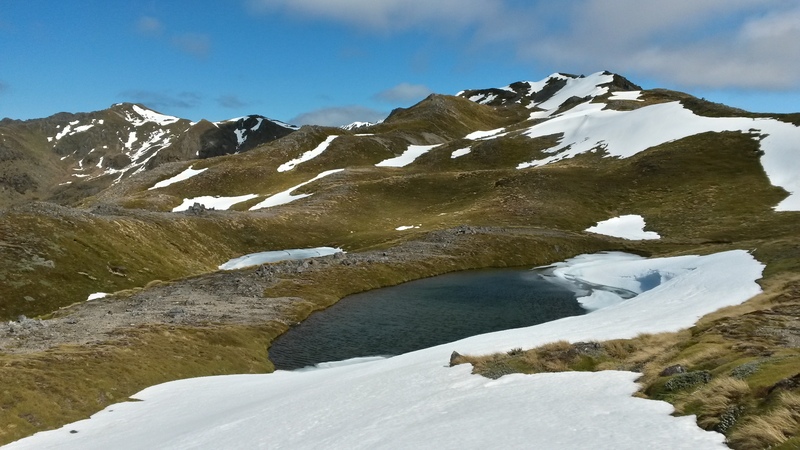 The patches of snow weren’t ice-axe-and-crampon worthy, but it was comforting to think that the extra gear had added to my weight training. I followed the tops of the hills around the basin, stopping frequently for snacks. There were no footprints in the snow; it must have been a while since anyway was up here. It’s a good feeling. Who doesn’t want to be strong and capable and independent? And for a brief moment completely free of responsibility for the welfare of others. 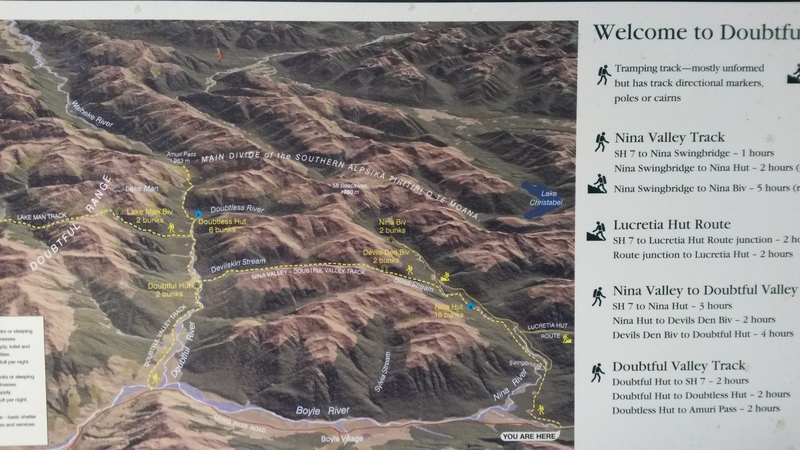 My tired thighs reminded me that I’m not a bionic human, and the last decent climb on the map before heading down to the saddle kept me from getting too cocky. 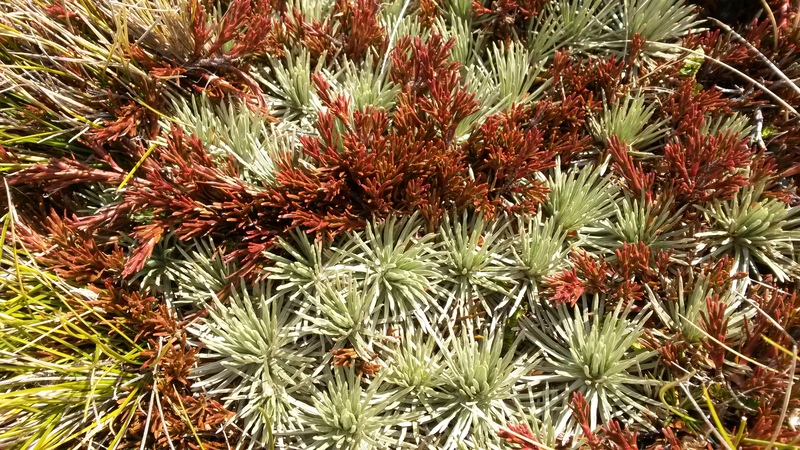 These tops aren’t actually grassy, they’re skinned in a bewildering array of miniature plants. 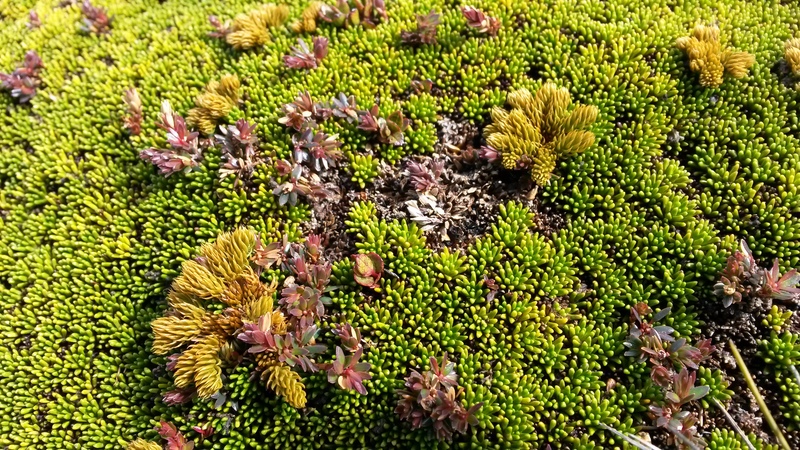 I suspect they belong to familiar plant families, but their alpine adaptations make them unrecognizable (to me). 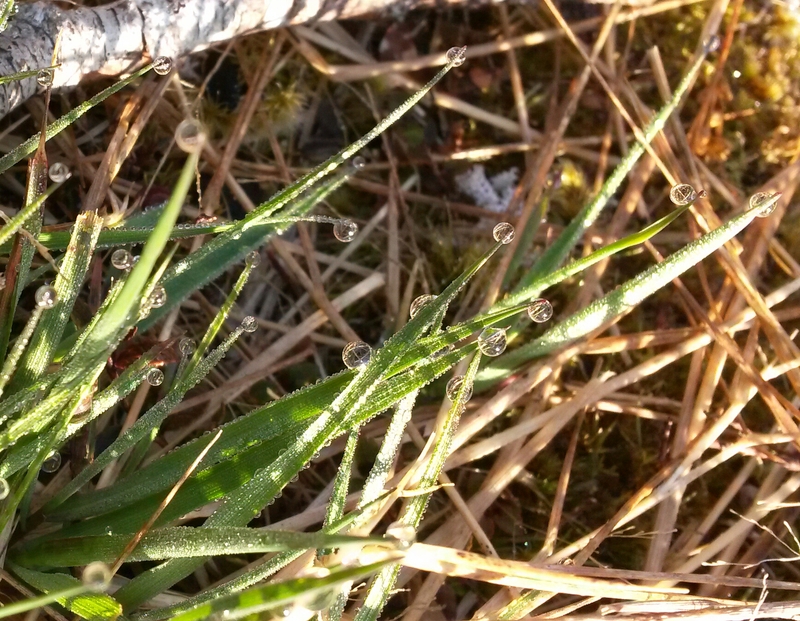 There was no trail over the tops, and I kept hoping that I wasn’t killing these tough little specimens with my boots. They’re tough to wind and snow and sun, but I bet they aren’t durable to foot traffic. Lots of reds in the foliage mix. Maybe they’re anthocyanins protecting leaves from sun damage? I guess the bare exposed rocks are cheap real estate, so someone is going to live there. 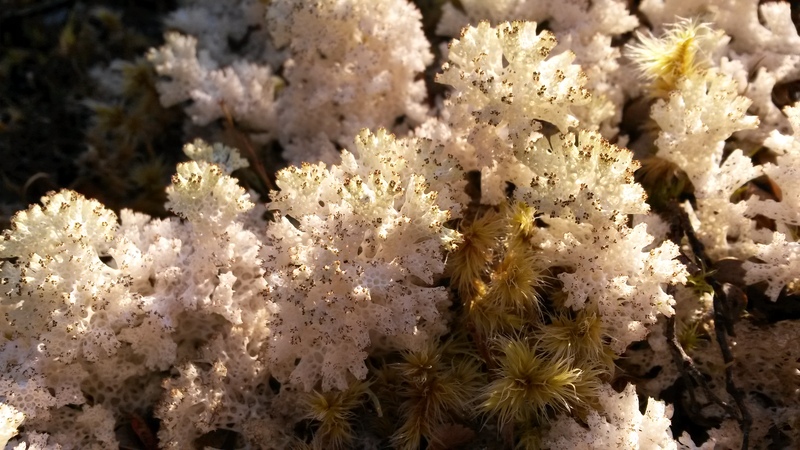 Lichens are super impressive! If you squint you might just be able to see the tiny hut in the saddle. 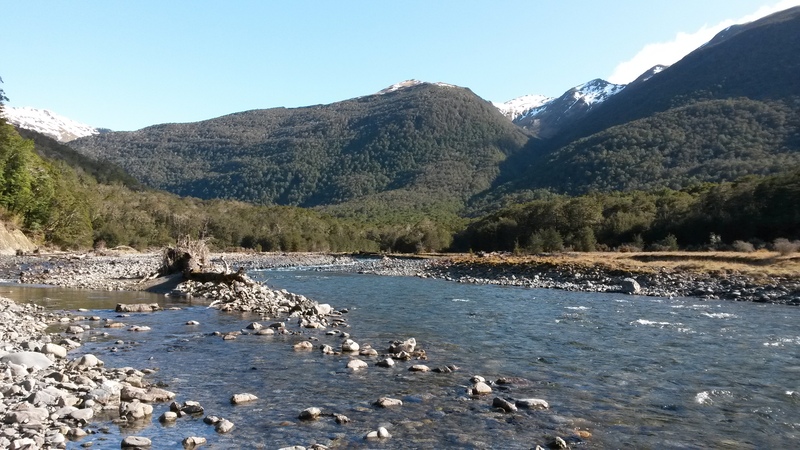 DOC calls it a “bivouac;” everyone else calls it a “biv” (three syllable words are too long for Kiwis). That’s where I planned to stay the night. I was thinking about cooking an early dinner and settling down with the latest edition of National Geographic when I noticed the pair of boots outside the door. Two pairs, to be precise. It’s a two-bunk hut. Darn. 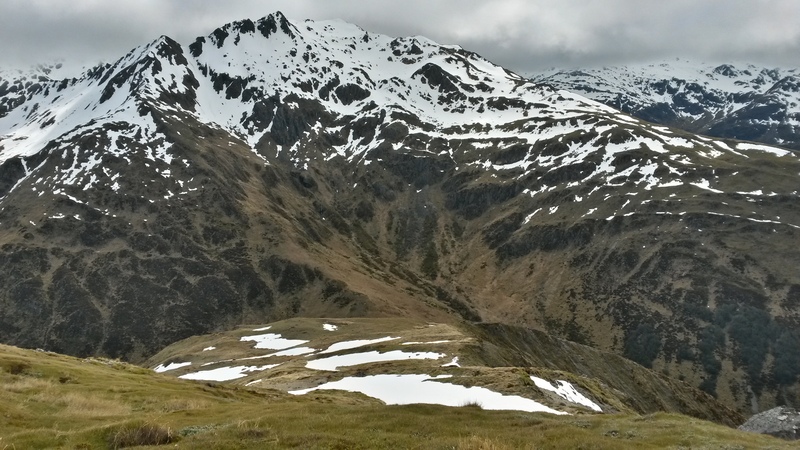 Good thing Nina hut is only 2 more hours down the valley (left in the photo; Doubtful valley is to the right). DOWN, is the operative term at this stage in the day. If I was facing a two hour up-hill slog, I wouldn’t have been so cheerful. 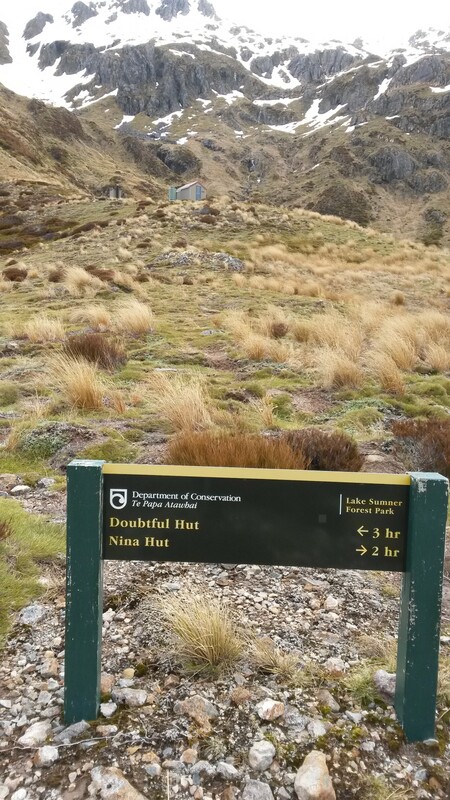 I cooked dinner while exchanging pleasantries with the other hikers (hunters), then set off down to Nina hut, wondering if I’d be treated to my first-ever floor berth if the sleeping bunks were all taken. My dad would have loved this bit of the hike. 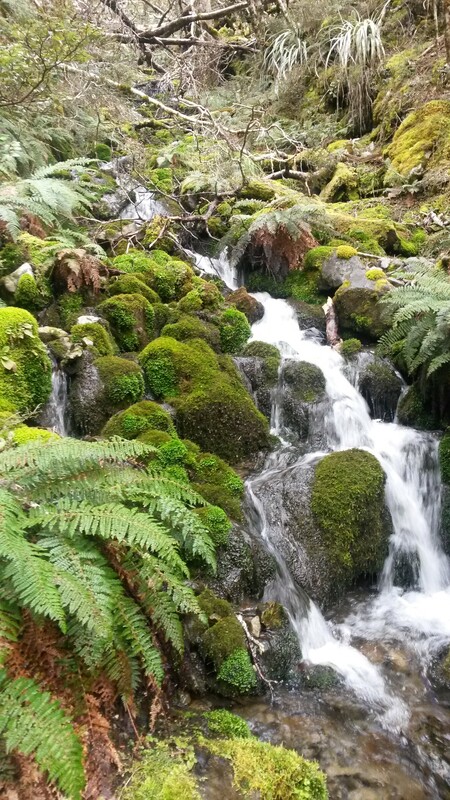 It’s very green, the brook is noisy and cheerful, and the moss is luxuriant. 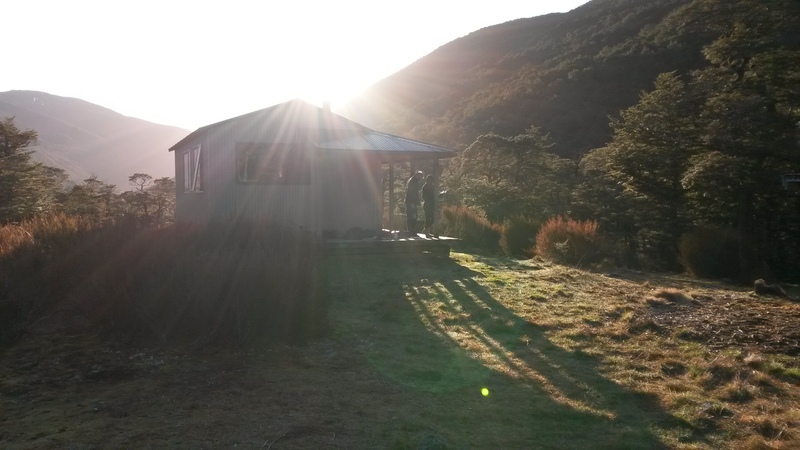 There was one space left in the 10-bunk Nina hut, to my relief, and I spent a cheerful evening in the company of some remarkably cordial teenage boys and their dads. I didn’t know 15 year old males did anything but grunt, but these guys pleasantly surprised me with their friendly conversation. They even asked me if I was a “professional” tramper. Ha! What flattery! Nope, I am a foreigner, but I’m just a mom out for the weekend. ….and grass…..I had two cups of tea and set out late after having done a whole sudoku in one sitting. 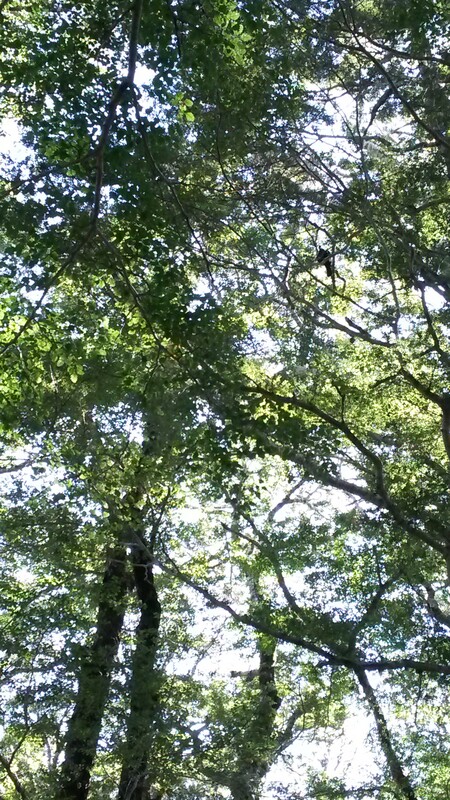 On the way out I passed several tui birds. They have a magnificent vocabulary for a bird, from rude squawks to flutey sequences that sound quite exotic. I didn’t hear anyone answer this guy, I think he was just enjoying his own voice. Now, if my “bush bash” had been through open woods like these, I wouldn’t have had anything to complain about. 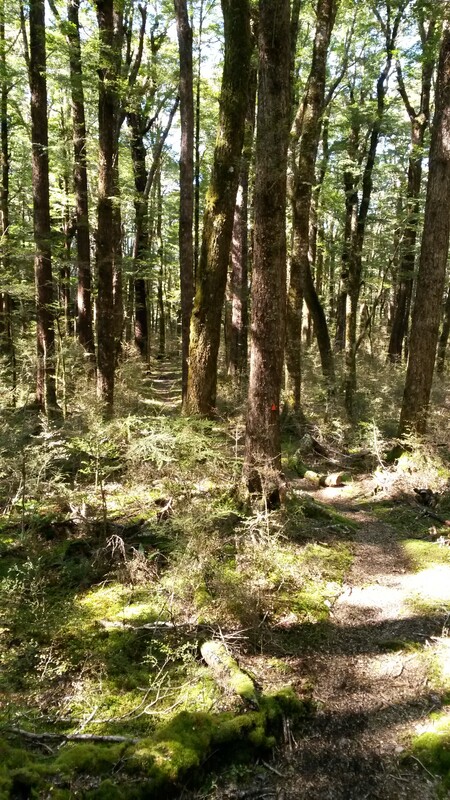 It’s amazing how much sun actually comes through in the beech forest. 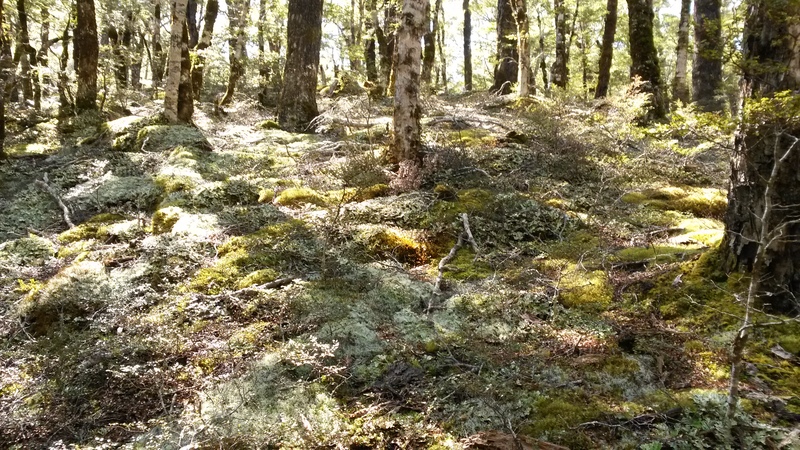 A forest carpet fit for a king….or perhaps an Ent. Goodbye for now mountains. The next restorative dose of wilderness is in November. 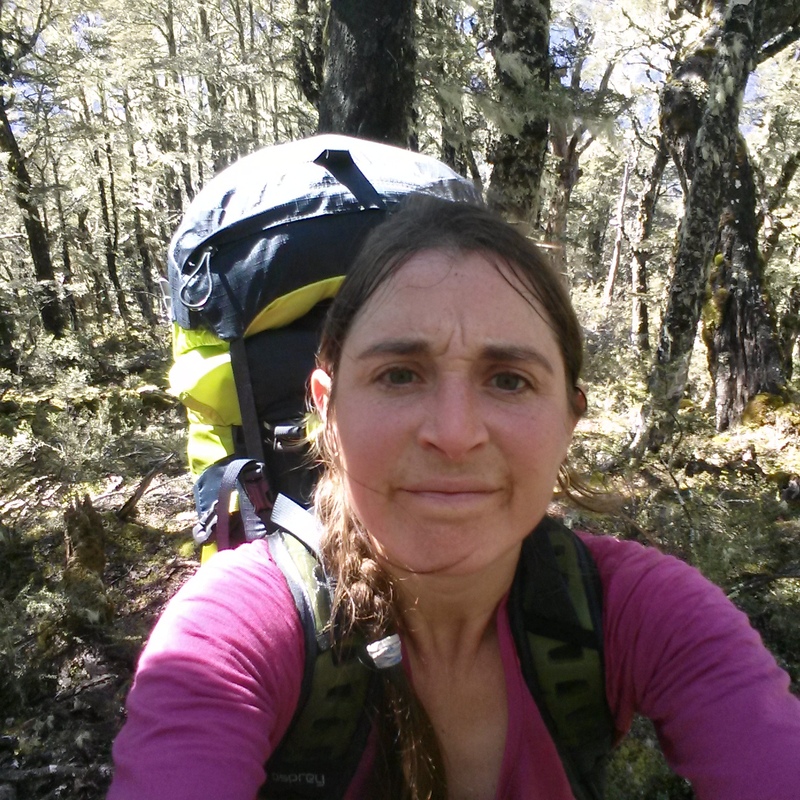 I’m going to watch for the upcoming title, “New Zealand Tramps” by Molly Shaw. (It will be the next Walk in the Woods event). As usual thank you for sharing your outing with all of us. Your photos allow us to experience so much of your adventures.